Q – How do you turn off the Accpac Splash Screen for a Terminal/Citrix user to reduce the loading process?A – On your Window Desktop, click on Start, Run, and then type regedit. Now, Right click on the right hand pane of the window, select New, String Value. Then, name it “splashscreen”. Double click on this string and set the value to NO. Warning – Before doing anything changes in the registry, make sure you backup it up first. Q – Why doesn’t Bank Services use the batch dates to record the Check and Deposit Entries from the subledger transactions? For example, in the Reconcile Statements screen, the deposits and withdrawal entries show a withdrawal date or deposit date that is not consistent with the originating subledger’s batch dates. A – This is by design. The dates in the Withdrawal Date and Deposit Date fields are populated with the login session date of the user logged into the company at the time the batches are posted in the subledger. If you would like a specific date to be generated in these fields in the Reconcile Statements screen, you should log into your company with that specific date as your session date. The alternative is to export the records, change the FSCYEAR and FSCPERIOD and/or the RECYEAR and RECPERIOD fields in the export file, then import the file back in to update the dates. Of course, this does not apply to manual entries entered directly into the Reconcile Statements screen. These fields can be populated manually at the time of entry. 1. In Outlook, click the Tools menu, point to Accpac CRM (or CRM), and click Uninstall. This should close Outlook automatically; if not, close Outlook manually. 2. In Windows Explorer, browse to C:\Windows\Downloaded Program Files (where C:\Windows is the directory where Windows is installed) and delete the ACCPAC CRM Outlook Plug-in file. 3. Still in Windows Explorer, browse to the C:\Program Files\Microsoft Office\OFFICE11\ADDINS folder (this is the default installation directory) and delete the CRMOutlookPlugin2.ecf file. 4. Open Outlook again and click Tools, then Customize. In the Customize dialog box, click the Toolbars tab. Highlight the CRM line and click Delete to remove the CRM toolbar. 5. With the Customize dialog box still open, click the Tools menu in the main Outlook window, right-click CRM and click Delete. This should remove the CRM sub menu from the Tools menu. Close the Customize dialogue box. 6. In Outlook, click Tools, then Options. On the Other tab, click Advanced Options then Add-In Manager. Deselect Redemption Helper Outlook Extensions and click OK to close all open dialog boxes. 7. Go to Windows Explorer to c:\Document & Settings\All Users\Application Data, and rename the ACCPAC folder. c:\Document & Settings\[user_you_are_logged_in_as_in_system]\Application Data, and rename the ACCPAC folder. If you are experiencing issues with Outlook integration, and would like to re-install the integration piece, it may be necessary to detect and repair Outlook before proceeding. To do that, with Outlook opened, click on Help | Detect and Repair. This process may require your Outlook/Office CD. Re-install the Outlook/SageCRM integration plug-in. Note: In order for the new settings to take effect, make sure that Outlook process is completely shut down. To verify, make sure that the OUTLOOK.EXE is not running under the Task Manager’s Processes tab. If Outlook version is older than Outlook 2003, make sure there is no MAPISP32.EXE running as well. Q – How do you change the name of a report category? To change these, go to Administration > Customization > Translations, and do a Find for “ReportCategory” under the Caption Family: field. The system will return all Report Category items found in SageCRM. 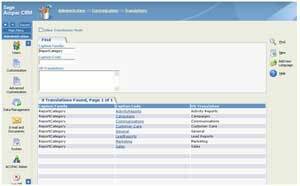 Select the Report Category that you want to modify and change the name of the Report Category under the US Translation: field or any other language translation fields depending which language the system is configured to. Note: Any changes to the system tables in Pro Series should be done by an ACCPAC Certified Consultant or Business Partner. Please ensure that there is a full and verified backup before proceeding. This should first be attempted in a test installation and the results should be fully verified before implementing in a live system. 1. Using FoxPro Access from the File menu, open the SYRFRXS.DBF. This is located in the root directory of the Pro Series installation. Note: This resolution maybe applied to other reports in Pro Series as well. However, there are some reports that do not support this option and therefore have a setting of “F” in the “Exportss” field. Test all changes thoroughly before implementing on a live installation. Q:How does voiding payroll checks at different times; affect the amounts on W-2 forms? Quarter Two 2004 is the current quarter. A check was created and voided in quarter two. How will this affect the W-2 amounts? All appropriate W-2 amounts for that quarter will be adjusted to reflect this change. However, if a check is voided in a closed quarter, the W-2 amounts will not be affected. Refer to the example below. Quarter Two 2004 is the current quarter. A check was created in quarter one but voided in the current quarter. How will this affect the W-2 amounts? This will not affect any W-2 amounts; an manual adjustment must be made to alter these amounts. Note: For more information on how to manually adjust the W-2 amounts, please refer to the “Origins of W2 Information and Amounts” whitepaper, attached to this article. Ensure that there is a full and verified backup of the Pro Series installation before proceeding. This entry was posted in Newsletter, November 2005 and tagged ACCPAC, Axis Newsletter, CRM Features, CRM Software, Customer loyalty, Customer Relations Management (CRM), Customer retention, employee retention, Enhanced customer satisfaction and retention, Enterprise Resource Planning (ERP), ERP Solutions, Sage Accpac, Sage Accpac ERP, Sage CRM, SageCRM. Bookmark the permalink.